Chris Brown & The Game decided to smoke up in the middle of the Hip-Hop All Star game Friday afternoon. Hip-Hop has always had a strong presence in the NBA All-Star weekend festivities over the years, and this year is no different. In fact, for the first time ever, Snoop Dogg decided to throw together a Hip-Hop all star basketball consisted of only rappers & artists. Co-hosted by 2 Chainz, who was the captain of the other team, Snoop & 2 Chainz revealed their teams earlier this week on Instagram. Snoop’s team consisted of Chris Brown, Kamaiyah, David Banner, Snap Dogg, K Camp, Daylyt, Hitman Holla, Joe Moses, TDot IllDude. Meanwhile, his opponent, 2 Chainz, drafted the following artists: Quavo, Young Dolph, Machine Gun Kelly, Wale, YFN Lucci, Jadakiss, Trinidad James, Young M.A, Lil Bibby, Lil Dicky, Mozzy, Skooly, Short Dawg and Key Glock. The game went down Friday afternoon in L.A., where Snoop Dogg’s West team took home the crown. 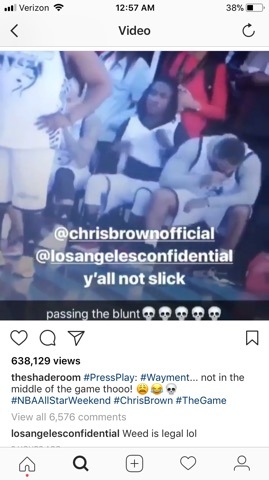 However while we’ve yet to receive any real highlights of the game so far, other than Snoop’s block (see here), some hilarious footage of Chris Brown & The Game hitting a blunt on the bench in the middle of the game has surfaced online. Spotted by TheShadeRoom, Chris can be seen slyly handing the Game the blunt under his leg while on the bench, to which The Game proceeds to keep his head down and hit it. The Game even decided to jump in the comments of the post, and remind everyone that it is now legal in California, where the all-star game was being held. Check out the hilarious clip (below). T.I. On Collaborating With Lonzo Ball: "No! He's A Ball Player"